Sesamum mulayanum N. C. Nair, Sesamum orientale L.
Sesame (Sesamum indicum L.) is a tropical and subtropical plant cultivated for its seeds, which yield about 50% of a high quality edible oil. Sesame oil meal, the by-product of sesame oil extraction, is used as a feed ingredient. Sesame is an annual, or occasionally perennial, species which can grow to 50-250 cm in height (Sun Hwang, 2005). Its morphology is extremely variable. The sesame plant can be branched or unbranched. The leaves vary in shape and size, and may be alternate or opposite (Oplinger et al., 1990). The growing sequence is indeterminate, with leaves, flowers and seeds being produced as long as the weather permits. At maturity, leaves and stems turn yellow to red in colour (Oplinger et al., 1990). It normally takes 125 to 135 days for unimproved sesame to reach maturity, but commercial varieties only require 90-120 days (Hansen, 2011). Sesame has an extensive root system that makes it very tolerant of drought. The stems are green, erect, quadrangular, longitudinally furrowed and densely hairy. The leaves are hairy, ovate, 3-17.5 cm long x 1-7 cm broad, and dull green in colour (Sun Hwang, 2005). White to pale pink bell-shaped flowers develop at the leaf axils along the stems. 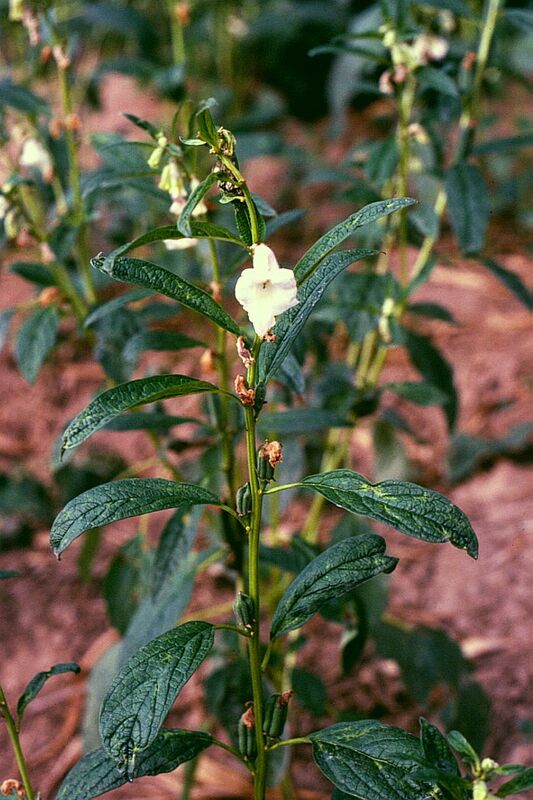 Sesame flowers are self-pollinated though some cross-pollination may occur. Only flowers borne 30 to 60 cm off the ground develop into fruits. The fruit is a deeply grooved capsule, 2.5-3.5 cm long, parallelepipedic in shape and containing 8 rows of seeds (about 100-150 seeds in total). The fruits of older varieties usually shatter, splitting open at fruit maturity and releasing seeds. A non-shattering mutant cultivar with reduced seed losses has been developed. Four to six weeks are necessary for seeds to mature. The seeds are variable in colour, small and flat with a point at one end. A 1000 seeds weigh is about 32 g. Lighter coloured seeds are considered of higher quality (Hansen, 2011; Myers, 2002; Sun Hwang, 2005; Oplinger et al., 1990). White seed varieties are produced in Mexico, Guatemala and El Salvador. Black seed varieties are grown in China and Thailand (Hansen, 2011). Breeding programmes focus particularly on 2 traits: the antioxidant factor in sesame oil (sesamol), and non-shattering high yielding potential (Hansen, 2011; Oplinger et al., 1990). Sesame is primarily grown for its edible seeds and oil, with 65% of the seeds being used for oil extraction and 35% for food. Sesame seeds have outstanding amounts of oil and a desirable nutty flavour after cooking. For these reasons, they are much appreciated in bakery, the candy industry and for other food specialties (Hansen, 2011). Sesame seeds are mainly used for their high oil content. They have a high polyunsaturated fatty acid (PUFA) content and rank 4th after safflower, soybean and maize for their PUFA content. Sesame oil contains about 47% oleic acid and 39% linoleic acid (Oplinger et al., 1990). It is rich in tocopherols and lignans (notably sesamin and sesamolin) that provide exceptional oxidative stability compared to other edible oils (Sun Hwang, 2005). There are two main types of sesame oils: the first is pale yellow, has a grain-like odour and a nutty taste, and is used for salad dressing and deep frying. The second is obtained from roasted seeds, and is amber-coloured and used in cooking as a flavouring agent (Hansen, 2011). Due to its stability, sesame oil can be used in margarine production where refrigeration equipment is lacking (Hansen, 2011). Sesame oil is used in pharmaceutical preparations as a vehicle for drug delivery, in insecticides and cosmetics. Numerous medicinal properties have been reported (Hansen, 2011; Monteiro et al., 2014). Sesame oil meal (or sesame oil cake) is the protein-rich by-product obtained after oil extraction. Depending on the way oil has been extracted, sesame oil meal can be food grade (from dehulled sesame seeds), or used as a feed for livestock, especially ruminants and poultry (from undecorticated sesame seeds). It is a valuable source of protein for animals (Hansen, 2011; Oplinger et al., 1990). Unlike other oil meals, sesame oil meal is usually obtained by mechanical extraction only (rather by mechanical extraction followed by solvent extraction) and its residual oil content is high. The hulls resulting from the dehulling of sesame seeds are discarded and can be used as fodder for ruminants or poultry (Mahmoud et al., 2015; Abdullah et al., 2011). Sesame is one of the oldest oil crops, its use being recorded in Babylon and Assyria 4000 years ago. It spread from the Fertile Crescent and is now found in many tropical and subtropical areas. It has been cultivated commercially in the USA since the 1950s. The worldwide seed production was 5.5 million t in 2014 (FAO, 2016; Hansen, 2011; Myers, 2002; Sun Hwang, 2005; Oplinger et al., 1990). Most sesame is produced in Africa (3.0 million t) and Asia (2.3 million t). India, Sudan, China, Myanmar and Tanzania account for 80% of world production. China, India, Taiwan, Vietnam and Mexico are the main users (FAO, 2016). In Ethiopia, sesame cake is sold in local markets (Gebremedhin et al., 2009). Sesame grows well in areas with long, warm seasons, from the equator to 40° North or South in both hemispheres, under conditions similar to those of the cotton crop (Sheahan, 2014; Sun Hwang, 2005). It does well in most soils but prefers those that are well-drained. It is particularly tolerant of drought and extreme heat, though it requires good soil moisture for its establishment (Sheahan, 2014; Hansen, 2011; Sun Hwang, 2005). A minimal seasonal rainfall of 500 to 700 mm is necessary for optimal seed yield. Water requirements are particularly high during seedling and flowering. Sesame is intolerant of waterlogging. Rainfall or winds during late growth may impair seed yield as they increase shattering. Moisture occurring at maturity increases fungal attacks. Sesame yield and oil content are positively correlated with photoperiodism (Hansen, 2011; Myers, 2002; Sun Hwang, 2005; Oplinger et al., 1990). Sesame has moderate tolerance to salinity (Sheahan, 2014; Hansen, 2011; Oplinger et al., 1990). Because of its deep root system, sesame scavenges nutrients at a greater depth than most crop root systems. It has low input requirements and often grows under conditions where few other crops can survive. These attributes make sesame an excellent candidate for low-input sustainable food systems (Sheahan, 2014). Sesame seeds have good viability and can be stored for about 5 years at room temperature. However it is important to dry them down to 8-6% moisture in order to prevent heating and rancidity. Frost might hamper seed quality (Hansen, 2011; Oplinger et al., 1990). Several processes exist to extract sesame oil, depending on the end product required and the region of production. The seed may be dehulled, cooked or roasted, and the oil extracted by mechanical pressure, resulting in a feed-grade, oil-rich sesame cake. Further extraction with solvent results in a feed-grade, low oil sesame flour. Dehulling is common in India, where sesame meal is an important food, and can be performed manually at village level or mechanically in conventional oil mills. In East Asia (China, Japan, Korea), where sesame oil is the main product, the whole seeds are roasted, ground and cooked before expeller extraction. In North China, seeds are soaked, roasted, dehulled and milled to make sesame paste, and the oil (called small mill sesame oil) is separated by centrifugation or gravitation (Sun Hwang, 2005). In Africa, farm-level extraction is performed by crushing with a grindstone and by adding boiling water to skim off the oil, resulting in a crude, low quality oil. 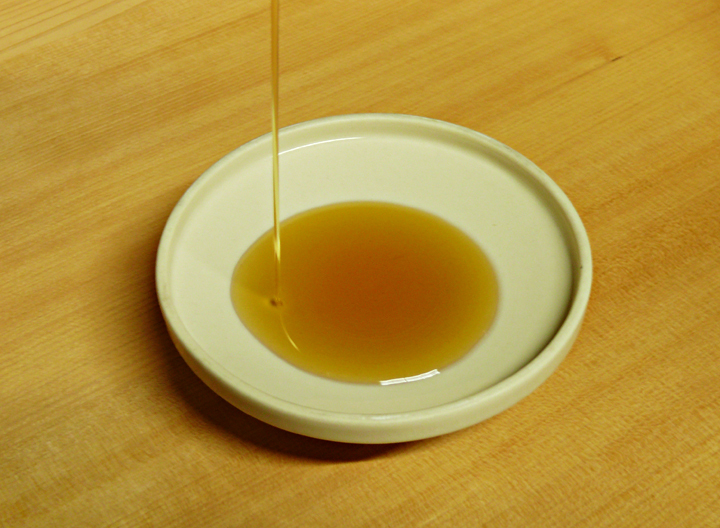 A more sophisticated process uses hand-operated presses and a 3-step extraction: the first extraction is done at room temperature and produces high grade oil; the resulting press cake is then heated and pressed to yield a coloured oil; this can then be refined to give a non edible oil (Mkamilo et al., 2007). Sesame oil meal (usually from non-dehulled seeds) is fed to ruminant livestock and poultry (Hansen, 2011; Oplinger et al., 1990). Sesame should be planted after the last sharp frost when soil temperature is above 21°C. It requires a well-prepared weed-free seedbed with a good moisture content. Sowing sesame just after rain or irrigation is recommended. Sesame seeds should be shallow planted at 2-3 kg/ha (Myers, 2002). Careful weeding is necessary for it to grow (Hansen, 2011; Myers, 2002; Oplinger et al., 1990). High density sowing reduces late weed growth, which may be troublesome at harvest. Sesame is frequently intercropped in smallholder fields. Strip cropping with maize and sorghum is also common, and protects sesame from strong winds (Mkamilo et al., 2007). Sesame is ready to harvest 90 to 150 days after being sown. Because frost is deleterious to seed quality the harvest should be done before the first sharp frost (Hansen, 2011). Harvest of non-shattering varieties can be done with a combine harvester provided all holes have been sealed to prevent losses of small seeds. As sesame seeds are fragile, it is preferable to use a low cylinder speed (half that for cereals). In shattering varieties, it is recommended to cut the plants when the stems are still green, and then to stack them in vertical piles (Hansen, 2011; Oplinger et al., 1990). Seed yields are about 400-500 kg/ha (FAO, 2016). Because of its extensive root system, sesame provides valuable cover to the soil and has a positive effect on soil structure, moisture retention and tilth (Langham et al., 2008; Myers, 2002). Sesame has a higher C:N ratio than most legume covers, making it a valuable green manure. It vigorously outcompetes weeds (Creamer et al., 2000). In some cases, it has been reported to have some potential to become weedy (Sheahan, 2014). Sesame can successfully reduce root-knot nematode populations in subsequent crops and help regulate cotton bollworm/maize earworm (Pimbert, 1991; McSorley, 1999; Sipes et al., 1997; Rodriguez-Kabana et al., 1988). Sesame attracts beneficial insects and is a source of feed for songbirds, quail and doves (Sheahan, 2014; Creamer et al., 2000). Sesame plants have been reported to accumulate and remove from the soils the organochlorine pesticide lindane, a neurotoxin that can persist in the soil for many years (Abhilash et al., 2010). Sesame oil meal is a protein rich by-product. Expeller sesame meal has a protein content of about 45% of DM, ranging from 32 to 53%, whereas solvent-extracted sesame meal contains about 48% protein. Expeller sesame oil meal is rich in residual oil, and thus in energy, though the oil content depends on the process and may be very variable, from 5 to 20%. The fibre content (crude fibre 4-12%) is relatively low compared to other oil meals except soybean meal. Lignin content is also low (below 2%). Sesame oil meal from dehulled seeds should have a higher nutritional value, but it is normally a food product. Sesame oil meal has a peculiar amino acid profile being low in lysine and rich in sulphur-containing amino acids. Unsaturated fatty acids (mostly oleic acid C16:0 and linoleic acid C18:1) constitute 80% of the total fatty acids. Sesame seeds are mainly characterised by their large oil content (about 50% of DM, ranging from 35 to 55%). They are also rich in protein (22-27%). The fibre content appears to be extremely variable with some varieties containing small quantities of fibre (crude fibre 4-8% of DM) while others are much more fibrous (13-20% of DM) (Sun Hwang, 2005). Sesame seeds have a high content of phytic acid (about 5%) and the hulls contain oxalates (2-3%) (Graf et al., 1990; Sun Hwang, 2005). As phytic acid reduces calcium availability, diets with significant amounts of sesame hulls, whole sesame seeds or non-dehulled sesame oil meal may need to be supplemented with calcium (Aherne et al., 1985; Göhl, 1982). Large amounts of oxalic and phytic acids may have adverse effects on palatability. Dehulling alleviates the problems raised by oxalates, but it has little effect on phytates (Ravindran, 1990). Though sesame oil is very stable, oil-rich sesame oil meal will eventually become rancid (Göhl, 1982). Sesame oil meal is a valuable protein and energy source for ruminants. Reported in vitro OM digestibility is high (83% in ADAS, 1988; more than 75% in Chandrasekharaiah et al., 2002). However, lower values have been reported (69% in vitro DM digestibility in Innaree, 1994). In Egypt, it has been used in the control diet of comparative studies on protein supply in goats (Kholif et al., 2015). Several processes have been tested to improve the nutritional value for ruminants. Treatment with 1.5-2% formaldehyde decreased rumen protein degradability with no effect or a positive effect on nutrient intake (Bugalia et al., 2008; Pani et al., 1998), and a positive effect on Ca and P balance (Pani et al., 1998). Formaldehyde treatment increased the digestibility of crude fibre and lipids, as well as indices of post-partum reproductive efficiency (Bugalia et al., 2008). Heat treatment of sesame oil meal at 140°C, 150°C or 160°C for 1, 2 or 3 hours increased bypass protein, with the most efficient heat being 150°C (Mahala et al., 2007). In Thailand, sesame oil meal introduced at 14 to 42%, substituting for soybean meal, in the diets of lactating crossbred cows, reduced DM digestibility, but did not result in significant differences in milk production, milk constituents, feed consumption and body weight (Innaree, 1994). In Iran, including 15% sesame oil meal in the diets of lactating dairy cow did not affect DM intake and increased milk fat, but decreased milk yield and feed efficiency compared to the control diet (mixture of soybean and cottonseed meals) (Shirzadegan et al., 2014). In Egypt, sesame oil meal included at 17.5% of the diet was found suitable for feeding lactating dairy buffaloes as it resulted in milk yield similar to that obtained with soybean meal and cottonseed meal (Mahmoud et al., 2014a). In Eritrea, in Barka cattle fed on a urea-treated sorghum stover based diet, DM intake was increased (6.13 vs. 5.81 kg/head/day) as was daily weight gain (741 g vs. 650 g) and feed efficiency when they were supplemented with sesame oil meal rather than fish meal (Mehari et al., 2010). In Egypt, mixtures of nigella meal (Nigella sativa) and sesame oil meal used as a total replacement for concentrate in calf diets had higher DM, lipid and crude fibre digestibilities, resulting in higher intake, higher daily weight gain, improved feed conversion ratio, and increased profitability (Mahmoud et al., 2014b). In Gambia, in young grazing N'Dama bull calves, sesame oil meal was fed as a protein supplement for 4 months at levels up to 400 g/day. Fed at this level, the sesame oil meal not only increased daily weight gain (271 vs. 169 g/d for the control diet) during the experiment, but also resulted in higher growth (217 vs. 158 g/d) after it (Little et al., 1991). In Ethiopia, sheep fed teff straw, with sesame oil meal at up to 30% of the diet, had a higher weight gain, enhanced carcass parameters, and overall profitability was increased (Fitwi et al., 2013). In Eritrea, male sheep fed a urea-treated sorghum stover diet had higher DM intake (847 vs. 826 g/head/d) and higher daily weight gain (134 vs. 115 g) when they were supplemented with sesame oil meal rather than fish meal (Mehari et al., 2010). In Sudan, sesame oil meal and groundnut meal ranked higher than cottonseed meal or sunflower meal as a supplementary protein for desert lambs over a 7 week fattening period. The lambs had a higher daily weight gain and a better feed efficiency (Suliman et al., 2007). An earlier experiment done with yearling desert lambs ranked sesame oil meal 2nd after sunflower meal for growth rate (Ahmed et al., 2005). In Egypt, mixtures of nigella oil meal and sesame oil meal used as a total replacement of concentrate in lamb diets decreased total digestible nutrients, but no significant difference was observed between the two diets in final weight and average daily gain. It was concluded that a mixture of nigella oil meal and sesame oil meal could replace a commercial concentrate in growing lambs (Mahmoud et al., 2014b). In Ethiopia, Abergelle goats grazing on natural pasture were profitably supplemented with different ratios of sesame oil meal and Faidherbia albida pods. The 1:1 ratio (105 g of each feed) yielded better intake and daily weight gain (80 g/d) (Weldemariam, 2015). Sesame meal has a high protein and energy content, but its deficiency in lysine, its fibre content and the presence of phytate and oxalates are limitations for its use in pigs. Early trials found that sesame oil meal could be used in growing-finishing pigs at up to 15% of the diet with satisfactory results (Squibb et al., 1951). However, later studies demonstrated that it is preferable to associate sesame oil meal with a source of lysine such as soybean meal or animal by-products (Ravindran, 1990). Sesame meal could only replace 10% of soybean meal in maize-soybean meal based diets for growing-finishing pigs and sows (Seerley, 1991). Generally, it has been advised to adapt the level of sesame oil meal in the diet according to the type and quantity of the other protein sources of the diet (Ravindran, 1990; Cunha, 1977). Ileal digestibilities of most of its amino acids tended to decline as the inclusion of sesame oil meal increased in pig diets, and daily weight gains and feed efficiency were hampered as the level of sesame oil meal increased from 0 to 12% (diet DM) (Li et al., 2000). When the formulation of pig diets took into account the apparent ileal digestibility of protein and amino acids, up to 10% sesame oil meal (DM basis) could be included in the diet without causing significant changes in total feed intake, average daily gain and feed conversion ratio (Tartrakoon et al., 2001). Due to potential palatability problems caused by oxalates, it has been recommended to limit the inclusion of sesame oil meal to 5% in starter diets (Ravindran, 1990). Sesame seeds are known to have a role as a natural antioxidant. In Vietnam, where small-scale farmers use diets based on non-defatted rice bran, which is prone to rancidity and to loss of palatability during storage, it was shown that the inclusion of 1-3.5% of ground sesame seeds limited peroxidation and enhanced feed intake and feed conversion ratio in pigs (Yamasaki et al., 2003). Sesame oil meal is rich in protein and energy but, due to its low lysine content and high methionine and cysteine contents, it is used as a supplementary source of protein with other oil meals such as soybean meal (Yasothai, 2014). Large differences in the quality and nutritional value of sesame products can be observed (Cheva-Isarakul et al., 1993). Phytates and oxalates are an issue for poultry feeding and can limit the use of sesame oil meal in practice. Amino acid digestibilities are high but processing at excessive temperatures can decrease amino acid levels and availability (Yasothai, 2014). Studies on the use of sesame oil meal in broiler diets tend to conclude that sesame oil meal can be used at moderate levels, usually below 10% (Mamputu et al., 1995; Rahimian et al., 2013; Daghir, 2008). Performance decreased at higher inclusion levels (Mamputu et al., 1995; Rahimian et al., 2013). Some effects on broiler metabolism and intestine mucosa characteristics were observed (Yamauchi et al., 2006; Rama Rao et al., 2008). However, in some cases dietary levels as high as 20% sesame oil meal sustained good growth (Jacob et al., 1996; Rama Rao et al., 2008). Feed intake is generally not affected by sesame oil meal in the diet, suggesting that palatability is not an issue. Adequate values for metabolizable energy and amino acid digestibility should be used since local products can vary significantly from those presented in international feed tables (Kang et al., 1999; Yasothai, 2014). Phytase addition improved performance in some cases (Sterling et al., 2001), although this effect was not constant (Rahimian et al., 2013). The general recommendation is to take great care on feed formulation when using sesame oil meal in broiler diets to avoid inadequacies in amino acids (lysine) and minerals (Ca, P, etc. ), which can occur if inappropriate values are used. In these conditions, the use of relatively low levels (5-8% of the diet) should be safe, while higher levels (10-15%) can be tested with high quality sesame oil meal, or if lower growing rates are acceptable. In layers, laying performance and feed efficiency were affected by levels of sesame oil meal above 4% of the diet (Mamputu et al., 1995; Cheva-Isarakul et al., 1993). High levels (15-20%) of sesame oil meal led to significantly reduced laying rates, feed efficiency and weight gain (Jacob et al., 1996). Differences between the performances obtained with sesame oil meals of different origins have been observed, possibly due to amino acid content or protein quality (Cheva-Isarakul et al., 1993). In pullets, the use of sesame oil meal above 5% of the diet led to reduced growth and uniformity in the flock, and delayed initiation of lay (Tangtaweewipat et al., 1992). Sesame oil meal should be used with care in layers, and only at low levels. In particular attention should be paid to feed formulation, particularly to the amino acid content (lysine). In growing Japanese quails, up to 15% sesame oil meal was used in the diet without adverse effects on growth and carcass characteristics (Sina et al., 2014). In laying quails, the use of sesame oil meal decreased egg production and feed efficiency, and is thus not recommended (Tangtaweewipat et al., 1992). The use of raw sesame seeds at 5 to 15% in diets for broilers reduced body weight gain and feed efficiency. Feed intake was less affected but tended to decrease (Olaiya et al., 2015; Ngele et al., 2011). Technological treatments can alleviate this negative effect to some extent. Toasting was the most efficient treatment, followed by soaking and boiling (Olaiya et al., 2015). However, even when toasted, sesame seeds led to performance below that obtained from control diets (Jiya et al., 2014; Ngele et al., 2011). In layers, the optimal level of soaked sesame seeds in the diet was 3%, which gave an improved laying rate with unchanged feed intake. With more than 6% sesame seeds, egg production and egg weight decreased, leading to a lower egg mass and feed efficiency (Diarra et al., 2008). The use of 1 to 2% sesame seeds improved laying rate in quails, without affecting body weight and feed intake. Fertility and hatchability were also improved (Al-Daraji et al., 2010). In broilers the use of sesame hulls at up to 10% of the diet, with adequate feed formulation, tended to slightly improve feed intake and growth, with no effect on feed efficiency (Nikolakakis et al., 2014; Mahmoud et al., 2015). In chicks, sesame hulls led to a decrease in growth performance, with a stronger effect at 12% inclusion than at 6 or 8% (Farran et al., 2000). Egg production decreased above 14% sesame hulls in the diet. At 7 to 14% sesame hulls inclusion, laying rate slightly decreased but egg weight increased, leading to a constant egg mass and feed efficiency. In all cases, sesame hulls decreased body weight gain in layers (Farran et al., 2000). Sesame oil meal has long been a traditional source of protein for rabbit feeding (Templeton, 1937; Benoit et al., 1948). Its high digestibility was established in the 1940s, with values up to 91% for crude protein and 90% for gross energy, corresponding to 15.05 MJ DE/kg DM (Voris et al., 1940). Sesame oil meal is included at 10-20% in the control diets of many experiments (Roy et al., 2002; Salma et al., 2002; Ibrahim, 2007; Fasiullah et al., 2010). In trials, sesame oil meal has been introduced at up to 38-39% of the diet of growing rabbits without any health problems or alteration of performance (Colin et al., 1977; Colin et al., 1978), and in one trial at up to 56% (Lebas, 1973). If sesame oil meal is to be considered as a suitable protein source for rabbits (Colin et al., 1974; Colin et al., 1978), its deficiency in lysine, which covers only 50% of the requirements of growing rabbits, must be corrected (Lebas, 2013). Thus, the utilisation of sesame oil meal in balanced rabbit rations requires a source of lysine, such as legume seeds or industrial lysine. Whole toasted sesame seeds were introduced safely in rabbit diets at up to 12%, but their utilization in balanced diets was limited by the very high lipid content of the seeds (52%). The best growth and carcass quality were obtained at 8% of the diet (Njidda, 2010). Due to the lack of experiments at the time of writing (2016), it is not known whether toasting is necessary for the use of sesame seeds in rabbit feeding. Sesame oil meal has been found to have a value similar to that of soybean meal for carnivorous fish, and has been used successfully as a fish meal protein substitute without negatively affecting growth. About 50% of fish meal was replaced with sesame oil meal in diets for rainbow trout (Oncorhynchus mykiss) (Nang Thu et al., 2011), and European sturgeon (Huso huso) (Jahanbakhshi et al., 2012). Innaree, W., 1994. Sesame cake feeding for dairy cows. Thesis, Kasetsart Univ., Bangkok, Thailand, 72 p.
Mkamilo, G.S. ; Bedigian, D., 2007. , 2007. Sesamum indicum L.. Record from PROTA4U, van der Vossen, H. A. M.; Mkamilo, G. S. (Editors). PROTA (Plant Resources of Tropical Africa / Ressources végétales de l’Afrique tropicale), Wageningen, Netherlands. Pimbert, M. P., 1991. Designing integrated pest management for sustainable and productive futures. Int. Inst. Env. Dev., Sust. Agric. Progr., Gatekeeper Series No. SA29.